Sri Krishna Jayanthi, Navarathri, Hanuman Jayanthi and Sri Ramanavami are celebrated in the Perumal temple. Shivrathri, Aipasi Annabishekam and Arundra Darshan are observed in the Shiva temple. Lord Brahmma graces from under the Vanni tree in the temple. 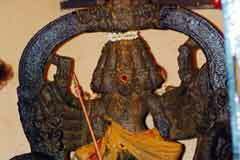 Lord Narasimha is holding the discus in His four hands. The temple is open from 7.00 a.m. to 11.00 a.m. and from 5.00 p.m. to 8.30 p.m.
Sri Kambaraya Perumal and Sri Kasi Viswanathar Temple, Kottai, Cumbam-625 516. 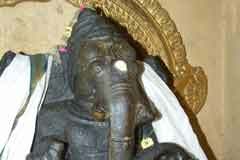 Sri Vinayaka of the temple is praised as Lord Siddhi Vinayaka. The Vimana, the tower above the sanctum sanctorum is of Tridala design. People pray for removal of obstacles in wedding proposals, welfare of children and prosperity in families. 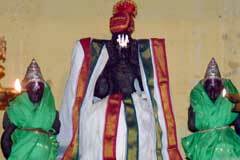 Devotees, on realizing their wishes, perform abishek to Lord Shiva and Lord Perumal offering vastras. They offer the traditional Vadamala (Vada is a popular dish of Tamilnadu. A garland is made of this preparation) to Sri Anjaneya, offering Ennai Kappu (applying oil on the idol), and curd rice as nivedhana. Thirumangai Azhwar was the ruler of Tirumangai in his early life. He used to feed 1008 Vishnu devotees each day. His riches dried due to this expense and could not continue the charity. He began to rob others to continue his scheme. To make his Vishnu devotion public, Lord appeared before the saint in His wedding attire with Mother and initiated Him to the eight lettered –Ashtakshara_mantra – Ohm Namo Narayanana. He became one among the Azhwars – Tirumangai Azhwar. Depicting his life and devotion, a festival – Tirumangai Azhwar Thirudia Vaibhavam- Azhwar’s robbing – is celebrated in the temple during the Aani (June-July) Brahmmotsavam. This is some thing like a play. The police arrest a person with the robbed articles and produce him before Perumal. The list of articles stolen by him would be read then, called Pattolai Vasippu. Perumal appears before Azhwar then. It is noteworthy that two temples, Kambaraya Perumal and Shiva are in the same campus with separate flag posts for each. On the Tiruvonam star day, a lamp-Ona deepam is lit in Perumal shrine. 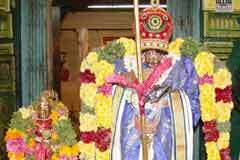 On the Vaikunta Ekadasi day, Perumal is dressed (alankara) as in Parthasarathy temple in Chennai with a moustache and a whip handling the chariot- the car of Arjuna in the Kurukshetra battle field. During the festival day, puja is performed to a stone post under which the Perumal idol was found. 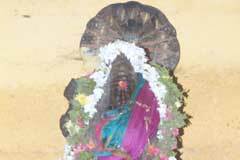 Mother Alamelu Manga Thayar graces from a separate shrine. The shrine is so structured with a Vimana – tower above sanctum sanctorum. There is also a shrine for Chakarathzhwar, the deity of the discus. 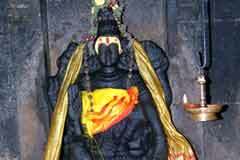 Lord Narasimha behind this shrine is holding discuss in all His four hands. Special pujas are dedicated to Him on Aani Brahmmotsavam with Homas. Lord Kasi Viswanatha graces in the Shiva temple on a square shaped Avudayar – peeta. There is also shrine for Mother Kasi Visalakshi. Lord Dakshinamurthi in this temple on the goshta wall is holding a Kamandala-water bowl with a handle. He is in Yoga posture without the banyan tree above Him, Muyalagan the symbol of ignorance under His feet or disciples. During Jupiter transition days, special Homas and pujas are performed in this shrine. Those facing adverse Jupiter effects pray here on the day. There are shrines for Lord Kasi Vinayaka, guardian deity Mottayandi and other deities. Lord Muruga appears differently with five faces forward and one at the back. Those facing Mars adverse effects and obstacles in wedding proposals, pray in this shrine. A king ruling this region then desired to build a temple for Lord Shiva and Lord Vishnu at a single site. Perumal appeared in his dream and said that there was a stone post at the foot hills of western ghats and that His idol was there. The king found Perumal there and installed Him here. 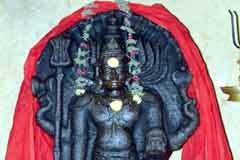 As the Lord was found under a stone post (Cumbam), He was named Kambaraya Perumal and the place Cumbam. He also brought a Shivalinga from Kasi-Varanasi and built the Shiva temple. He celebrated the consecration of the temples the same day. 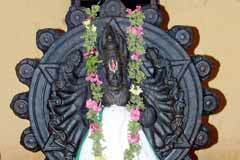 The Holy tree Vanni is worshipped as Lord Brahmma. 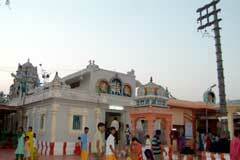 People thus have the opportunity of worshipping Lords Shiva, Vishnu and Brahmma in a single temple. Cumbam is 37 km from Theni. 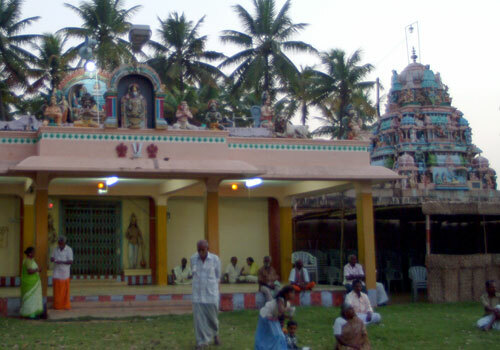 The temple is close to Cumbam bus stand.